Definition at line 2702 of file xmlstorage.h. Definition at line 2704 of file xmlstorage.h. Definition at line 2709 of file xmlstorage.h. Definition at line 2776 of file xmlstorage.h. Referenced by read_file(), and read_stream(). Definition at line 2756 of file xmlstorage.h. Referenced by XMLStorage::XMLMessageFromString::XMLMessageFromString(), and XMLStorage::XMLMessageReader::XMLMessageReader(). Definition at line 2761 of file xmlstorage.h. Definition at line 2741 of file xmlstorage.h. Referenced by ExplorerGlobals::read_persistent(), and XMLDoc(). Definition at line 2768 of file xmlstorage.h. Definition at line 2800 of file xmlstorage.h. 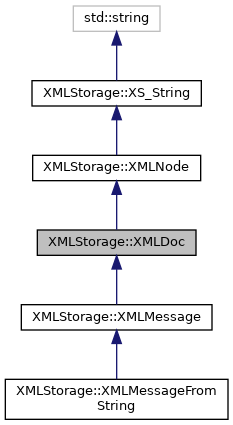 Referenced by XMLStorage::XMLMessage::toString(), write_file(), and write_formating(). Definition at line 2820 of file xmlstorage.h. Definition at line 2815 of file xmlstorage.h. Definition at line 2827 of file xmlstorage.h. Definition at line 2835 of file xmlstorage.h. Referenced by read(), and ExplorerGlobals::read_persistent(). Definition at line 2834 of file xmlstorage.h.